Average garden soil with good drainage. Excellent. Most muscari are hardy to -25F (-32C); cold tolerance varies with species. Topdress with rich compost in spring, when new growth appears. Muscari that have naturalized in lawns usually need no additional fertilizers. Pansy . Petite muscari make excellent neighbors for taller daffodils or tulips. They are popular for naturalizing in open woodlands, or along the edge of the lawn. Set out dormant bulbs from late summer to early winter. Cover the bulbs to four times their depth with loose soil. Spacing can be as close as 2in (5cm) between muscari bulbs when planting them for spring display. Allow 6in (15cm) between bulbs when naturalizing; they will multiply on their own. 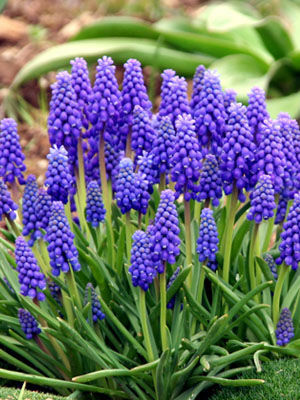 Easy to grow and long-lived in many climates, muscari is a great low-maintenance bulb to add to informal landscapes. Vibrant shades of blue are available in several cultivars. Tiny muscari blossoms can be combined with pansies in mini -flower arrangements. Cut when one third of the bell-shaped florets are open. As the flowers fade in the garden, trim them off with scissors or pruning shears if you want to prevent reseeding. Muscari have few pest problems and are seldom eaten by deer. They are best grown in sites where their tendency to multiply is welcome.